Thousands of women relate to Point Of Grace because they have grown with the group and their music over the past decade - from college-age girls to women with careers and families. 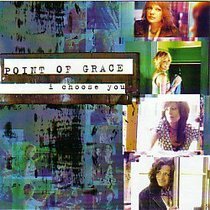 Long-time followers as well as a new generation of fans will continue to grow with and embrace the new-look and rejuvenated sound of Point Of Grace on I Choose You. This is truly the best that Point Of Grace has to offer, thanks in part to new writers, producers and new group member Leigh Cappillino.